I love a good crispy pork loin, but I’m not a fan of a lot of fried food. I will eat my fish fried, but that’s about it. I found this recipe in my Clean Eating magazine, March issue and right away wrote it down. I love using panko crumbs because they are so crispy without having to deep fry everything. 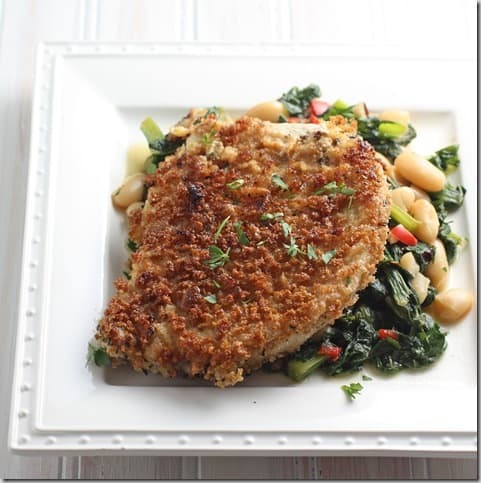 Panko Pork with Beans & Greens. 1. Make a dredging and breading station close to the stove with 3 plates. 2. Pound the pork loins into thin cutlets, if they are not already thin sliced. 3. Add salt and pepper to taste to the flour. Add an egg mixed up to the second plate. Add the crumbs and chopped herbs to the 3rd plate. 4. Heat pan to medium high. Add oil. When heated, begin dredging pork in flour, egg, and panko. 5. Cook 3 minutes on each side. Remove to a towel lined plate and keep warm. Work in batches until all cutlets are cooked. 1 lb of chopped greens. I used turnip greens. 1/2 cup broth or water. 1. In pan with pork drippings, add 1 Tablespoon of wheat flour. 2. Whisk until mixed. Bring heat up to high-medium (7-8 on a 10 scale). 4. Add chopped greens. Immediately add a lid to the pan so they steam and wilt. We are NOT boiling the death out of them. 5. After 5 minutes, remove lid, stir well, add lid and wait another 3-4 minutes. 6. Add 1/2 can of beans. Stir until heated through.